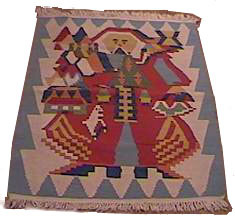 This Father Noel Kilim tapestry was designed and hand-woven specially for Nuance in Turkey. It depicts a jolly santa with a sack full of toys. The origin of St. Nicholas is said to be in Demre, Turkey where his church still stands. One legend has it that he would drop gifts for the poor children through the chimney. Another legend tells us that the gifts were for young girls who could not afford a dowry. Made of 100% wool, this kilim (flat weave) can be washed like a delicate sweater in cold water. Leave out to air dry. Approximate size 3' x 5' COLORS AND SIZES MAY VARY.